Billy plays an angel in the music video for "You're Only Human" which is a nod to Frank Capra's "It's A Wonderful Life." 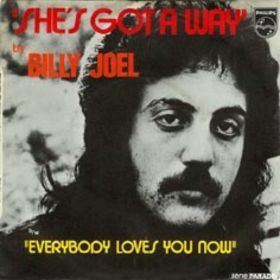 ﻿ "You're Only Human" was one of two new Billy Joel songs on Greatest Hits I and II. The song was written in light of a wave of teenage suicides that had made national news in the mid 1980's. Billy himself had contemplated and even tried to commit suicide in his early 20's (see "Tomorrow Is Today") and could relate to the emotional angst and turmoil that teens facing serious problems were experiencing. He says "but I wouldn't be telling you if I hadn't been there myself." The song became a top ten hit. The lyrics are straightforward and clear. Musically, the song is a synth-driven bouncy romp. It sounds a bit dated today, with the heavy use of synthesizers and somewhat contrived vocal affectations. For this reason, I'm not a big fan of the song from a musical perspective, but it conveys a hopeful message. Billy donated royalties from the song to the National Committee for Youth Suicide Prevention. Billy is a generous philanthropist, having supported many worthy causes over the years including Charity Begins at Home and Long Island Bay fishermen's groups. 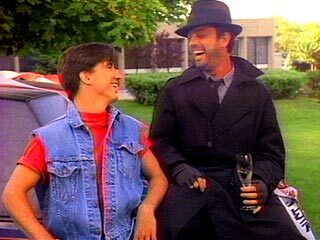 The music video for the song featured Billy in a role similar to the character Clarence in the Frank Capra movie It's A Wonderful Life. Billy coaxes a teenager, who was about to jump off a bridge, to come down off the side of a bridge, and shows him what life would be like if he had jumped and killed himself. In one scene, Billy shows the teenager that he helped save the life of another teenager who was drowning. According to this article on Retroist, the teenager in the video who is saved from drowning is portrayed by Adam Savage, host of the television program Mythbusters. But hold on . . .
Photo still from the music video to "You're Only Human"
Live performance from 1986 in Philadelphia. Billy discusses "You're Only Human (Second Wind)" and the music video in this 1985 interview. Billy and the band perform "You're Only Human" for the first time in concert in over 25 years, and dedicate it to the people of Orlando in 2016. Billy discusses the two new songs on Greatest Hits I & II, on SiriusXM radio in 2016 (audio).